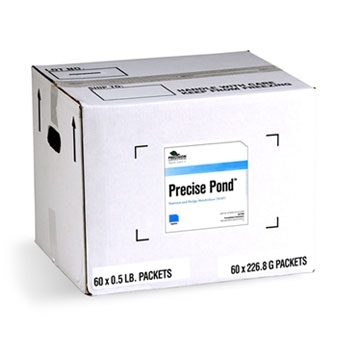 Precise Pond is a combination of enzymes and bacteria that preemptively digest phosphorus and nitrogen in the water column, while accelerating the breakdown of partially decomposed organic matter, waste and sludge accumulation on lake and pond bottoms. 3 to 6 pounds per surface acre of water. 1.5 to 2 pounds per surface acre of water.